Preheat oven to 350. Butter a shallow casserole or baking dish approximately 10x13 inch; set aside. Cook shredded cabbage and onion in a small amount of water until tender. Meanwhile, in a small bowl, mix flour with a small amount of the milk. In a large bowl, beat eggs, stir in basil, nutmeg, salt and pepper. Add flour/milk mixture and the remaining milk; set aside. Drain cabbage, stir butter into the cabbage until melted; then stir in shredded cheese. 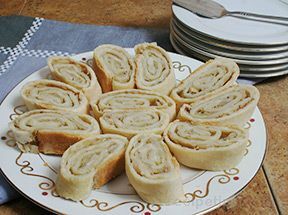 Fold in egg/milk mixture. 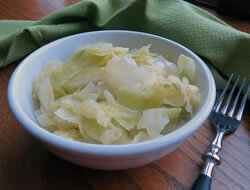 Spoon cabbage into prepared dish. 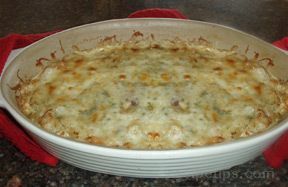 Mix Parmesan cheese with bread crumbs and spoon on top of the casserole. Bake for about 55 minutes or until top is golden brown and bubbly.